Pindyck’s dissection of the work of the world’s climate modelers — these are the people associated with the IPCC and other organizations who bring us dire predictions — is contained in a study to be published in the Journal of Economic Literature, and recently published by the National Bureau of Economic Research (NBER). His study is entitled “Climate Change Policy: What Do the Models Tell Us?” He provides the answer in a two-word sentence that immediately follows: “Very little.” This is an uncharacteristically blunt assessment coming from a publication of the NBER, the most authoritative organization in its field — it is the NBER which officially decides when U.S. has entered or left a recession, for example. The blunt talk pervades his study — 21 pages that methodically eviscerate any pretence that the climate change modellers have produced anything that anyone, anywhere can rely on for any decision requiring more authority than would be provided by a Ouija board. If a respected MIT professor, after studying a plethora of climate models, has declared that such models are “close to useless as tools for policy analysis”, then hundreds of climate modelers jobs must surely be under real threat. When his peer-reviewed research finding the models are next-to-useless is published in the leading journal for economists, who could have confidence in them? And if policymakers have no confidence in the models, how can they assess the cost:benefit of policy proposals? Has anybody attempted to write a rebuttal? Robert S. Pindyck is the MIT Prof but it was Robert Murphy that raised the red flag initially in his testimony to the U.S. Senate Hearing “Climate Change: It’s Happening Now” i.e. Murphy’s testimony is now corroborated by Pindyck. I would describe it as completely incestuous. It’s great to see a scientist of such standing actually have the guts to call BS on the models. Maybe science can regain some of the credibility lost by climatologist shenanigans. It will take a lot of time to rebuild the trust, but this is one step in the right direction. But what happens if it cools i.e. T = -1 ? I remain surprised by the credulity of sentient adults who believe the output of models. They remind me of small boys who lie on their parents carpeted living-room floor pushing model cars and trucks about while making appropriate engine noises and conferring all the qualities of reality on their toys in their own imaginations. Did those adults who believe in the outputs of climate models have deprived childhoods, entirely lacking generous adult relatives who ensured their healthy progression through all the required developmental stages by supplying toy cars, trucks and aeroplanes? Robert S. Pindyck is not a physicist or an engineer, he is the economist who pretty much wrote the book on options theory. I tried to read his stuff about ten years ago, it’s pretty hard going. In the absence of a link to the actual paper, I surmise that what he is saying is not that the models are wrong, but that they are no good at making policy decisions. This is all about cost-benefit tradeoffs, not climate science. Constructing a ‘damage function’, would be next to impossible, especially when a lot of the damage occurs from black swan events where the probability has changed but nobody knows by how much. Exactly. It is economists that are running the ostensibly functional but actually useless IAMs, not physicists or engineers because the IAMs are being applied to the ECONOMY (e.g. GDP) which is not the primary sphere of physics or engineering. Obama’s Climate Action Plan policy (but not US Congressional policy because he’s circumvented them via the EPA) is a result of this economic methodology. Fortunately not here in NZ though. But fortunate for the US that it has economists that know bogosity when they see it. Err no, he’s saying the IAMs “have crucial flaws that make them close to useless as tools for policy analysis”. That would be the equivalent of “wrong” Simon. Actually it isn’t. IAMs are climate modeling coupled to economic modeling (hence “integrated”) – both components (although he’s broken them down into six) are flawed (e.g. “climate sensitivity” and “damage function”) rendering them useless for policy decisions. 3. How do IAMs and GCMs differ? Integrated assessment models generally include both physical and social science models that consider demographic, political, and economic variables that affect greenhouse gas emission scenarios in addition to the physical climate system. General Circulation Models (GCMs), however, focus on the physical climate system alone. Many IAMs do include some form of climate modeling scheme in their routines, such as zero-dimensional or 2-dimensional energy balance models, but due to computing time limitations it is currently infeasible to integrate a full 3-dimensional GCM with a human dimensions model to create an IAM. Until computers become fast enough to significantly reduce computation times, IAMs will not be able to configure a full GCM into their model structure, and must rely on simpler forms of climate models to forecast changes in climate based on future scenarios of greenhouse gas emissions and other significant variables. [Goddard] “Two other category five hurricanes hit the US last century – Camille in 1969 and the Labor Day Hurricane of 1935, which was the most intense hurricane to hit the US since 1850. The arbitrarily assigned probability may have changed but there’s no actual superstorm increase Simon. Well yes, that’s the problem with imaginary events isn’t it? Like the blocking high over Greenland that pushed Sandy over New York. It’s existence was so improbable that it was 5 std. dev. from the mean. How did it get there? Changes in the jet-stream arguably caused by an Arctic warming much faster than the rest of the world. No direct proof, but evidence of a smoking gun. Large blocking highs are now evidence of global warming? Hmmm. I (and many others) thought the existence of a tropospheric hotspot confirming positive feedback from atmospheric water vapour would be good evidence of AGW. Funny how some people still believe in AGW when the hotspot has failed to materialise in over 40 yrs. I’m a bit confused Simon, how does AGW work again when there is no positive feedback from water vapour? Sounds like a scientific assertion. Reference please? The cold Arctic air mass in 2012 was what downgraded Sandy at landfall, and hardly a black swan. Two GCM papers appear to be creating a “buzz” at present. “Pause”, “hiatus”, and “divergence” now standard climatological terms in the literature apparently. Nicely identified and I hope you’re right. Most of the mainstream media offered us a bizarre “story” in the recent two or three days. The absence of global warming in recent years – well, it’s really 17 years now – has been “explained” by the Pacific waters. Problem solved, the belief in the global warming ideology may continue unchallenged, we’re de facto told. which is bad enough but I will mostly focus on the journalists’ added spin which is even worse. The Guardian’s Fiona Harvey will be used as my sample but the comments below are applicable almost universally. The more you use natural variations such as El Niño, PDO etc. to explain what’s actually going on and what’s being observed, the more important the natural drivers become, the more irrelevant the CO2 gets, the more the skeptics who claim that the climate change is mostly natural are shown to be right (many skeptics have talked about the important influence of the ocean cycles and patterns for many decades and most skeptics today are well aware about the tight PDO-global-temperature correlation in the last 100 years), and the more discredited the AGW doctrine becomes along with its defenders. Is that really so difficult for Fiona Harvey to understand this trivial point? Do we have to read all the garbage about CO2 that manifestly has nothing to do with any of the important observations or insights and not even with these not-so-important observations of the recent events in the Pacific Ocean? Even average U.S. and EU politicians are beginning to understand what the hiatus means (why not journalists in the Guardian?) and they want a credible explanation in the IPCC AR5 summary that will be out in one month from now. This week, Nature publishes a study online suggesting that a recent cooling trend in the tropical Pacific Ocean can explain the current hiatus in global warming. Authored by a pair of scientists at the Scripps Institution of Oceanography in La Jolla, California, the paper does not say why the Pacific seems to have entered a prolonged ‘La Niña’ phase, in which cooler surface waters gather in the eastern equatorial Pacific. It is also silent on where the missing heat is going. But it does suggest that this phenomenon — affecting as little as 8% of Earth’s surface — could temporarily counteract the temperature increase expected from rising greenhouse-gas emissions (Y. Kosaka and S.-P. Xie Nature http://dx.doi.org/10.1038/nature12534; 2013). Previous modelling studies have linked the pause to La-Niña-like conditions that have prevailed since 1999, suggesting that heat that would otherwise go into the atmosphere is getting buried deeper in the ocean. 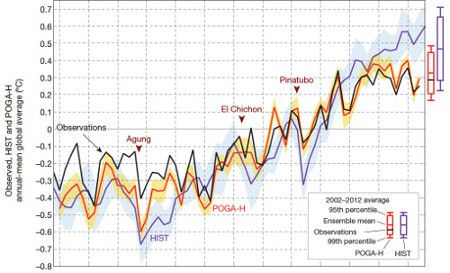 And scientists at the National Center for Atmospheric Research in Boulder, Colorado, have a study in the press indicating that decades in which global air temperature rises rapidly — including the 1980s and 1990s — are associated with warmer temperatures in the tropical Pacific, as exemplified by La Niña’s opposite effect, El Niño (G. A. Meehl et al. J. Climate http://doi.org/nkw; 2013 [hotlink]). The Scripps researchers also confirmed that El-Niño-like conditions can boost global temperatures. Heh! Kosaka and Xie (2013) find a cooler tropical Pacific explains “the current hiatus in global warming” in the 2000s. Then Meehl et al (2013) find a warmer tropical Pacific explains “decades in which global air temperature rises rapidly — including the 1980s and 1990s”. So much for greenhouse gas forcing (and too late for AR5 unfortunately). Timo Niroma: ‘Sunspots: The 200-year sunspot cycle is also a weather cycle. The other thing that seems apparent is that the general warming trend has been going on at least 1,800 years so that the third century AD may be the coldest century for at least 2000 years. Its only rival is the latter part of the 17th century. 1690’s may have been almost as cold as the years 250 to 270. The cold periods later during the first millennium AD are more dramatical than the Little Ice Age thousand years later. On the other hand we may now live in the second mildest climate Anno Domini. Warmer periods seem to have occurred only from about 930 to 1200 AD with an interruption about 1030-1080. In mind the Roman Warm Period 1000 years earlier in mind, we may speculate that warm periods last about 350 years and really warm episodes don’t exceed 100 years. Does this imply a sudden end to today’s warm period in 2030-2050 (warming began in 1700, and the real warm period in 1930). Kosaka, Xie, Meehl, Hu, Arblaster, Fasullo, and Trenberth (and commentary on the papers) are only looking at small oscillations in much larger and longer cyclicity. But having (belatedly) discovered the short-term oscillations (but only one phase each – Kosaka/Xie cool, Meehl et al warm) perhaps we can look forward to them discovering long-term supercycles too (or even just one phase at least). They had better get a wriggle on though because Niroma’s 2010 warm-cool supercycle transition ticked on by 3 years ago and the 2014 warm-cool transition in other similar scenarios is just around the corner. Discovery in retrospect isn’t exactly cutting edge from the impression given of their (Kosaka/Xie, Meehl et al) combined catch-up revelations of the last 30 yrs of a well known (but not by them) 60 year cycle indicate. A tardy “discovery” (by them) of well known 1000+ year supercycles wont be a good look either. The news here is that the previously denied “pause” has been accepted as real by mainstream climate scientists, has forced open the bounds imposed by previous modeling, and has been openly, unambiguously acknowledged by a peer-reviewed paper in Nature. Leaked copies indicate the scientific consensus on the issue has only strengthened, as has the confidence in climate models showing continuing warming. Prof Hunter has seen some of the work that has gone into it and says it will annoy those still in denial. ”It will receive favourable attention from people who are serious about the issue,” he says. ”Because it is more definitive than it was last time and that’s just what happens, because the science is getting better and more comprehensive. Does that include divergence deniers? Any idea why this article appears in the ODT Lifestyle magazine? Is climate change alarmism a lifestyle? Speaking of divergence deniers, I see it is fashionable in NZ to bang on about the warmest winter on record, even though this is based on a six to eight week period dominated by a northerly airflow. So picking 17 years of no warming is cherry picking, and picking 6 weeks of weather is……? “no one, to date”. Poor Katharine, she’ll have to update her essay in light of the recent papers upthread and IPCC AR5 “leaks”. I wonder which laws of physics she is referring to? Being swept away by the tide of subsequent posts unfortunately. Readers may recall the recent paper that blamed “the pause” in global temperature on ENSO changes in the Pacific Ocean. As upthread, the control knob governing Earth’s 1000+ year temperature supercycles is something else entirely. Sceptics have been demanding observed natural oceanic cyclicity be incorporated in the global climate models for a long time to realistically model climate processes but only now has someone got around to doing a little of it (kudos to K&X for getting the ball rolling). What Dana doesn’t say (as usual what is not said is more important in Real World than what is said in Warmer World) is that as soon as even a small part of the Pacific ocean SST is dynamically introduced (not initialized) to the model, the simulation is then powered by the natural process in the dynamic forcing (POGA-H) which gazumps the previously dominant CO2 forcing in the initialization (HIST). Consequently, POGA-H mimics (models) climate temperature MUCH better than HIST alone demonstrating the insignificance of CO2 forcing. A no-brainer passed over by Dana at SkS because it shatters the narrative. [Note: that’s not the best differentiation between HIST and POGA-H but it’ll do]. An interesting week in climate change science and climate change politics – sometimes a little difficult to distinguish between them! We also have another paper [Fyfe, Gillett and Zwiers], published the same day in Nature Climate Change, seeking to explain the mismatch between observed and estimated warming over the last twenty years, specifically with reference to “some combination of errors in external forcing, model response and internal climate variability”. It looks to me like we are now seeing the beginnings of an acknowledgement by the wider climate science community that natural processes (in particular those mediated by ENSO and PDO cycles – El Nino Southern Oscillation and Pacific Decadal Oscillation, respectively) can have a significant effect on our climate in that they can interrupt rapid predicted CO2 mediated warming to create a 15 year pause and even set the planet off cooling again. However, there seems to be a lack of an accompanying acknowledgement, inherent in this argument, that therefore natural climate forcings have a far more significant role to play in climate change, comparable to, or greater even, than hypothesised anthropogenic influences. Which leads us to the obvious, and the ultimate in climate change heresy, i.e. that 20th/21st Century warming trends have been contributed significantly to by natural influences at play in our ocean/atmosphere coupled climate system, even – perish the thought – that natural forcings have dominated that recent warming trend. We see this reluctance to take the next logical steps very clearly in the following comment taken from the Nature paper referenced above: “Although similar decadal hiatus events may occur in the future, the multi-decadal warming trend is very likely to continue with greenhouse gas increase”. What we basically have at the moment is a PDO in negative phase which is tending to put a lid on world temperatures and even drag them down. ENSO at the present time is fairly neutral, i.e. neither La Nina or El Nino. ENSO is, to a large measure, constrained within the longer period PDO and moderated by this longer period cycle, but ENSO can, and does, flip polarity whilst PDO remains either positive or negative, thereby reinforcing warming/cooling, or tending to act against the prevailing PDO trend. So if we get a strong La Nina soon, this will tend to exacerbate global cooling, and vice versa if ENSO goes into El Nino phase. Hence, the anthropogenic global warming predicted by climate scientists is, for a variety of reasons, not showing itself and this is placing global warming policy advocates and scientists in a tough position. They may argue that this is a temporary glitch, a minor interruption in an otherwise continual late 20th century/21st century ‘catastrophic’ warming trend. The problem is, it is neither minor, nor particularly temporary, lasting anywhere between 12 and 20 years, depending on how you look at the figures and which dataset you choose to use. Nor also was it widely predicted, as claimed, by the climate models used by the IPCC, particularly those developed in the 1990s. Even now, a 15 year hiatus in global warming is a very rare occurrence in model runs and let us not forget, it is the climate models, not observations, which still drive current thinking on the threat posed by a hypothetical anthropogenic global warming. Natural variability was, and still is, regarded as minor compared to the effects of man-made CO2 on climate change according to IPCC scientists – though we wait with baited breath for the soon to be published finally completed AR5. That’s what an interesting new article in Nature Climate Change [Fyfe, Gillett and Zwiers] points out. The article, “Overestimated warming over the past 20 years,” by members in good standing of the “climate community” compares model simulations from 37 of the climate models being used by the Intergovernmental Panel on Climate Change to project future temperatures with the actual global temperature increase over the past two decades. It seems to me what the researchers are saying in so many words is that the current batch of climate models have not been validated using actual temperature trends. One possibility for the mismatch between actual temperature trends and the model projections is that the modelers have set climate sensitivity (response of the climate to a doubling of atmospheric carbon dioxide) too high. As I have reported before, more recent research has significantly lowered estimates for climate sensitivity which suggests that future warming will also be lower. Next month the Intergovernmental Panel on Climate Change is set to release its update on the physical science of climate change. It will be interesting to see how (or if) its authors try to explain the growing gap between the model projections and the actual climate. “Interesting week/paper” in the opening. “It looks/seems to me” in the middle. “growing gap/mismatch” near the end in respect to the upcoming AR5. There’s a lot of people seeing the insidious situation the IPCC is facing now – and why it is by its own making by joining the dots in only 2 or 3 (including Meehl et al) papers just out re natural variability versus what the IPCC has been promulgating. There is growing evidence to support the hypothesis that the pause cause is tied to a change in tropical Pacific Ocean circulations. What are the implications of this for climate sensitivity and attribution of warming in the latter part of the 20th century? The paper by Kosalka Xie (discussed on the previous thread Pause tied to equatorial Pacific cooling) is generating substantial discussion in the blogosphere and twitosphere. I focus in this post not so much on the pause, but on the warming in the last quarter of the 20th century. I’ve had email and twitter discussions on this with Ed Hawkins and John Nielsen-Gammon. One major issue is exactly how Kosalka and Xie conducted their simulations in terms of forcing the equatorial Pacific temperatures; another is how to interpret the implicit external forcing that exists in the POGA-C simulation. A Mathematical Theory of Climate Sensitivity or, How to Deal With Both Anthropogenic Forcing and Natural Variability? The results of the Kosalka and Xie simulations can be interpreted in numerous ways. Trying to filter out the ENSO from the PDO signal seems to me to be an erroneous thing to do, given their intrinsic relationship. Using these simulations to attribute the pause (since 2002) to the cooling effect of ENSO/PDO has a corollary that the warm phase of the PDO in the last quarter of the 20th century also contributed to this warming. “The interesting thing about POGA C is that it uses FIXED external forcing. External forcing has some small influence via the specification of the 8% surface temperatures in the central Pacific, which includes the effects of PDO/ENSO as well as external forcing. So the question du jour is: Does POGA C or POGA-H minus HIST provide a better estimate of the impacts of ENSO/PDO on the global climate? Have to say I wasn’t seeing what JC is/was seeing in POGA C but the above quote helps a little but could be more clear. My first impression was that POGA-H minus HIST show the impacts of ENSO/PDO best …..globally……..but now I’m starting to see what JC is getting at (I think) although she’s comparing global (POGA-H) with the tropical Pacific (POGA-C) – I think. POGA-C mimics observations WITHOUT anthro forcing but ONLY in the tropical Pacific. POGA-H mimics observations WITH anthro forcing globally when constrained by tropical Pacific SST. Is it reasonable to deduce (as JC appears to) that 0.68 – 0.4 = 0.28 is the GLOBAL anthro contribution 1975-1998 by comparing global (POGA-H) to regional tropical Pacific (POGA-C)? I don’t think so, I deduce that the anthro forcing cannot be a global phenomenon if it is NOT apparent in tropical Pacific simulations vs observations (that I can see). In any event, HIST is garbage. Definitely a MAJOR issue EXACTLY “how Kosalka and Xie conducted their simulations in terms of forcing the equatorial Pacific temperatures” if POGA-C is not well understood by the likes of Judith Curry and John Nielsen-Gammon when analyzing such a breakthrough development. Some people think belief in God and belief in manmade global warming are incompatible. Two evangelical climate scientists rightly corrected that in The Christian Post, pointing out that they believe in God and in global warming. But they went on to make serious mistakes of their own. We, too, are evangelical climate scientists. We, too, believe in manmade global warming. But, unlike Katharine Hayhoe and Thomas Ackerman, we believe natural climate variations might far outweigh human-induced variations and that attempts to control future global temperature by reducing greenhouse gas (especially carbon dioxide—CO2) emissions will cause more harm than good to the poor for whom Hayhoe and Ackerman express concern. While Hayhoe and Ackerman insist that their belief in dangerous manmade climate change is a matter not of faith but of sight—of scientific evidence—we are convinced that it is precisely the opposite. Why? Because the observational (scientific) evidence conflicts with it. As illustrated in the two graphs below, the average (mean) carbon dioxide-driven warming predicted for 1979–2013 by the computer climate models on which Hayhoe and Ackerman depend for their alarms runs about three-and-a-half times the actual observed warming. Even the few model predictions closest to reality run at least 60% higher than observations. And as the second graph shows, contrary to the models’ predictions, there has been no significant warming for about the last 17 years. We agree. Therefore we challenge them, or other evangelicals of their choice, to a formal public debate—with a scientist, an economist, and a theologian on each side—at an evangelical college of their choice. Up for debate would be the magnitude, causes, and consequences of recent and foreseeable global warming and whether fighting it by reducing CO2 emissions would cause more good than harm to the poor. Using it wouldn’t cure the planet. By the year 2100, according to his [IAM] model, the earth’s temperature rises to 3.45 degrees Celsius above its level in the year 1900, and climate-related damages amount to some $17 trillion. Still, compared with doing nothing it would yield a $3 trillion return. That, he says, is the best we can do. Business logic will prevail even more when business completely dumps idiotic anti-prognostications like that. The Standard has put me on moderation for making some factual statements about AR5. You’ve plenty of stamina Andy. Those antics and attitudes get a bit tiresome. They might have a bit of traction now but in 12 months? 24 months? 5 years? The metrics aren’t on their side, or the IPCC’s. I’m sure many of the IPCC know that but they needed a last gasp before it all falls apart. News to David Suzuki evidently – metrics that is. At these times I feel like channeling Richard Lindzen’s monotonic delivery style that has a sense of bored inevitability about it. I’m sure that the hysterical nutjobs that inhabit “The Voice of the NZ Labour Movement” will put me out to pasture at some point. What should be noted though, is that the IPCC is, by definition, a propaganda operation. Its self-defined role is, “to assess … the scientific, technical and socio-economic information relevant to understanding the scientific basis of risk of human-induced climate change, its potential impacts and options for adaptation and mitigation”. The organisation, by its own account, takes as a given the existence of “human-induced climate change” and, therefore, it is entirely unsurprising that it finds: “human influence on climate clear”. It could do nothing else. On the other hand, no one with any sense, or understanding of the basics of science, could take their science from an overtly political organisation, with such an obviously distorted statement of principles. Obviously those who promote and assist the aims of the UNIPCC have never heard of the folk tale about the sky falling in. Perhaps they need to have a look at themselves! Henny Penny, also known as Chicken Licken or Chicken Little, is a folk tale with a moral in the form of a cumulative tale about a chicken who believes the world is coming to an end. The phrase “The sky is falling!” features prominently in the story, and has passed into the English language as a common idiom indicating a hysterical or mistaken belief that disaster is imminent. Versions of the story go back more than 25 centuries and it continues to be referenced in a variety of media. The sanctimonious vermin that hover around blogs like Hot Topic and The Standard really are the utter dregs of humanity. These “people” really are beneath contempt. One one known as One Anonymous Knucklehead is Rob Taylor, I am sure. You do notice this as common behaviour amongst the climate skinheads though. You make some apparently valid point, with references, and then they sneer and taunt you. Eventually, when you rise to the bait, they feign shock and ban you. Ever noticed how the socialist commentators often uses aliases that make themselves out to be superior thinkers, such as ‘Forward Thinker’ or ‘Gandalf’? Narrow squeak getting those error margins in before comments closed. I don’t think Forward Thinker will “Like” your last comment. I did.